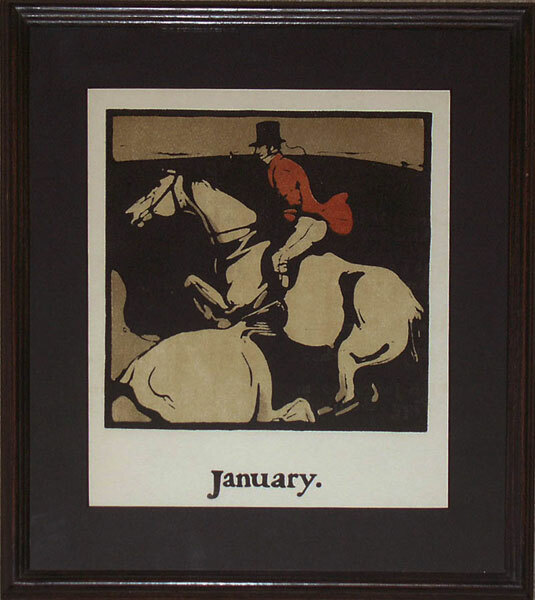 A wonderful set of twelve lithographed prints by William Nicholson, depicting a different sporting activity for every month of the year, published in London by William Heinemann in 1898 and printed on Japanese vellum. The sports illustrated start with Fox Hunting in January and end with Ice Skating in January. In between we have archery, coaching, boxing, cricket, golf, racing, shooting, riding, coursing and fishing. Nicholson (1872 - 1949) was a printmaker years before he became known as a portrait and landscape painter. As half of the Beggarstaff Brothers (with Jimmy Pryde) he produced posters for commercial products and theatrical events. The style of these posters - simple shapes; flat colour - became the hallmarks of Nicholson's graphic work. The Almanac of Twelve Sports, published in 1898 firmly established him in the public's mind and brought him immediate success with the public and critics while he was still a young man. The prints, originally conceived as a tiny edition of hand coloured woodcuts, were published as lithographs in 1898.